¿Se enseña aquí? Translation, writing, place: So, what is a chapbook? So, what is a chapbook? 1. a small book or pamphlet of popular tales, ballads, etc., formerly hawked about by chapmen. 2. a small book or pamphlet, often of poetry. A chapman, if you're wondering, is a peddler. Not too long ago (okay, probably longer than I think--I'm always losing track of this kind of thing) Poets and Writers ran a feature or two on DIY chapbooks of varying sorts. I was tempted, and I kept the magazine issues on the bottom shelf of that dictionary stand, but I haven't made one yet. I might, though. In grade school, we had a Young Authors Fair when we all made books. Each kid wrote her stories or poems, illustrated as necessary, and then we made the covers, sewing the pages together (probably stapling, sometimes) and folding fabric or red-flocked wallpaper out of one of those heavy sample books over the cardboard. It was the best. I loved the whole event. All our books would be laid out on tables in the gym, and our parents would file through to ooh and aah. It felt totally real--we had made real books. I kept making books long after grade school, though I haven't done much for a while. Still, I've been thinking about a bookbinding class. Just as art supplies lure me with their ranked rainbows in open boxes--just take one new colored pencil, or maybe two; just like candy--the bookbinding supplies on the next shelf sing out, You, too, could do this. Use your words this way. I never developed much patience or skill with fabric crafts or wood. I couldn't build a dictionary stand like the one my grandfather made. But I do like paper. I like the juxtaposition of the handcrafted and the high-tech. Even as I type this on my snazzy laptop, I'm thinking about the gorgeous paper scraps I've been hoarding all these years, waiting for a project. Perhaps we can have both, at least for a while--the e-book and the pamphlet of handmade paper sewn with spider silk. There won't be spider silk, but my chapbook, Detours, I'm happy to say, will soon be available from Burnside Review. 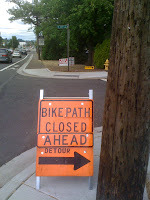 More on that to follow--detour ahead! For about a dozen years I did an annual booklet as a way of keeping in touch with friends. Like a Christmas letter that got out of hand. I would run about 50 copies, thirty or forty pages, xeroxed and bound however it fit my fancy. For my cover I once used old coastal navigation maps and another time splurged on hand-made paper. I sewed or stapled the bindings and illustrated it with my own drawings or photos or anything whose copyright I figured was not too diligently guarded. I filled it with stories I wrote about trips I had taken and whatever I was writing at the time or old items I thought they hadn't seen. It began as a casual Notebook and wound up something of the Book Beautiful. It was great fun and I still put aside interesting bits of art or paper stock that I think I might someday want to use, but for now my blog is enough of that sort of work. I like the booklet (chapbook?) as annual letter idea. And the coexistence of odd, small, special, handmade, careful, personal books with the flash and splash of blog "booklets" and bigger, printed books. I wrote promiscuously in those days, things I could not even imagine finding a publisher for, and my annual Commonplace Book was a way to share them with my far-removed and long-suffering friends. I also kept a daily journal, whether at home or abroad, and wrote long and often illuminated letters. I did not want for material and only taste and good judgment restrained me. Then I started writing about my great grandfather in the Civil War and my writing became more focused and, I feared, less amusing, and I began to substitute chatty Christmas cards. It was great fun, though, and I would recommend it to anyone.